There is a specialized importer here, Canada Food, and I know a couple places in Amsterdam that sell a few bottles, but I think Europeans still look to Canada chiefly for icewine. I was back in Canada this summer and was able to taste the wines in bars and restaurants, and of course from bottles purchased in the government stores. 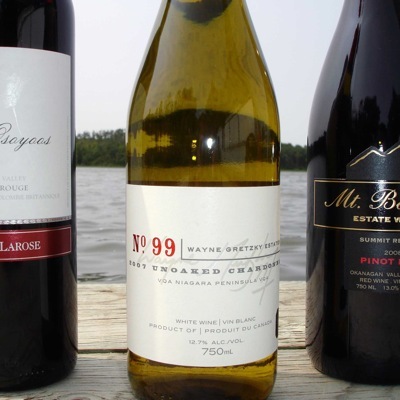 Canadian wines feature prominently in bar and restaurant wine menus, and my experiences ranged from meager to good. At the Hilton Garden Inn restaurant in Halifax, for example, the wine menu featured Lindeman's Bin 65 Chardonnay and Sartori's Soave Biologico for $38 Cdn, ex taxes. The wines are available here in the supermarket or shop for six euros, including tax. On the other hand, the Halifax airport lounge had good wines by the glass for airport-friendly prices. The following are tasting notes I made for three random bottles I purchased at the provincial liquor store in Prince Albert, Saskatchewan. All prices are in Cdn dollars, without tax. This is actually the beautifully named "second wine" of Osoyoos Larose, a joint venture between the Canadian wine giant Vincor and the French Groupe Taillan, owners of Château Gruaud-Larose. It's very much an assemblage; the back label is a who's who of Bordeaux dark grapes, present and past: Merlot, Cabernet Sauvignon, Cabernet Franc, Malbec and Petit Verdot. All that's missing is Carmenère. 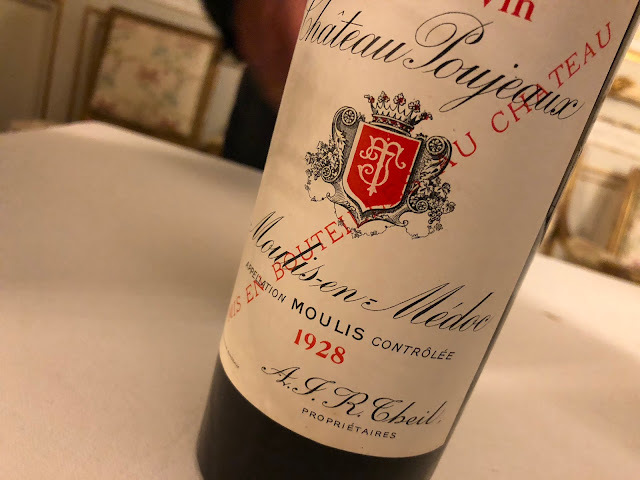 Possessing a deep bouquet of plum and dark cherry, leather and spice, the taste is dark and full bodied, a bit spicey with notes of blackberries, licorice and some chocolate at the end. This wine is obviously made in a Bordeaux style and strives somehow to be Bordeaux. It comes pretty close, and I applaud the effort. Wayne Gretzky, for those who don't know, was one of history's greatest ice hockey players, and 99 was the number he wore on his jersey. He is a Canadian icon and has earned mega millions as a player and coach. Like fellow famous Canadian Dan Akroyd, he purchased a winery in Ontario and used his name to market his brand. Of course I had to get a bottle. I wouldn't call it "The Great One", but it's really quite refreshing, an extremely nice wine for the price, slightly full bodied with clean white fruit, pear and green apple that is nicely balanced with medium high acidity. Gretzky scores again. Mt. Boucherie is British Columbia's largest family owned winery, and the Gidda family has been growing grapes in the Okanagan since 1968. The wine has only a faint hint of cherry in the nose, and some leather. A bit thin in the mouth, tart red fruit not coexisting nicely with hard tannins, unfortunately. Recognizably Pinot but a bit thin, unbalanced with a short aftertaste. I know that Mt. Boucherie is a respectable producer, and the 2006 Pinot Noir was especially praised, so I assume 2008 is a lesser vintage. And now that I am back, I wish someone would start importing this beautiful sparkling icewine, which I wrote about a couple years ago, into Holland.